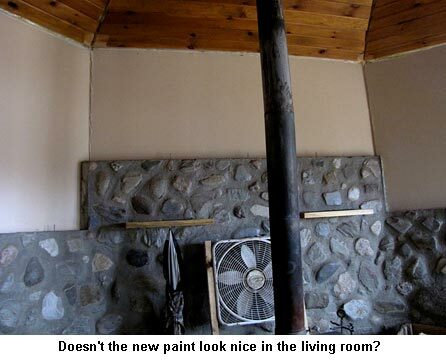 The painting of the living room is finished. Ashley did a great job and didn’t get a drop on anything. 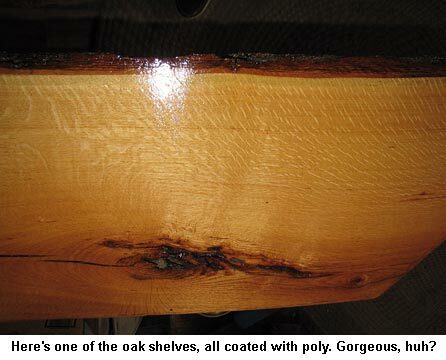 I’ve been coating the oak mantle and shelves with more poly and they’re ready to put back up as soon as the last coat dries. They look very good. Our peppers are ready to be transplanted into their little individual Styrofoam cups so I’ll be doing that tomorrow. The tomatoes are nearly all up and looking good in the little plastic greenhouses in the living room windows. Boy do we ever have a variety this year! The chickens are pumping out eggs and David is helping me by catching the “wild” chickens, cutting the flying feathers from their wings and putting them in the chicken run. We’re also holding the extra roosters out in the old small chicken coop, getting ready for a butchering day in the near future. We have way too many roosters but after they are all canned up, we’ll have lots of chicken-based meals available right from the pantry. Those “wild” chickens are a pain as they not only get in my flower beds, digging “fluffing” holes, but also run in the garden, scratching newly planted seeds up then later on eating tomatoes. Not this year, guys. Great to see and hear of all of the springtime things going on at your place Jackie! Thank you for the update! Yep, me too. We think it’s a Yoga pose; sideways-facing dog……. Spencer is doing great. We put him on a diet as there was too much Spencer. Now he again has a shape; kind of round, but still, a shape. Ashley’s golden retriever, a year and half old, keeps Spencer running and that helps. Ashley did a great neat job. Hondo is tired from watching people work. Wish I was that flexible. 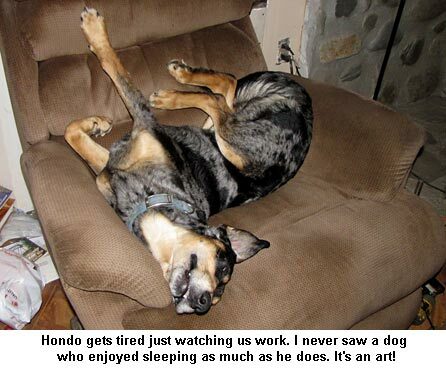 Hondo sure finds some interesting postures to sleep in. Lucky dog! How is Spencer doing? We haven’t heard much about him lately.